Every other historical issue is debated as a matter of course, but influential pressure groups have made the Holocaust story an exception. Anyone should be encouraged to investigate critically the Holocaust story in the same way they are encouraged to investigate every other historical event. This is not a radical point of view. The culture of critique was developed millennia ago by Greek philosophers like Socrates, and was renewed centuries ago during the Enlightenment. Revisionists agree with establishment historians that the German National Socialist State singled out the Jewish people for special and cruel treatment. In addition to viewing Jews in the framework of traditional anti-Semitism, the National Socialists also saw them as being an influential force behind international communism and behind the so-called international “finance capital,” which they held responsible for the worldwide economic crisis and for the impoverishment of German workers. During World War II, Jews were considered to be enemies of the German State and a potential danger to its war efforts, much like the Germans, Italians, and Japanese were viewed in the U.S. Consequently, Jews were stripped of their rights, forced to live in ghettos, conscripted for labor, deprived of their property, deported, and otherwise mistreated. Many tragically perished. Revisionists generally hold that the Allied governments, and in particular the Soviets, decided to carry their wartime “black propaganda” of German monstrosities over into the postwar period. This was done for essentially three reasons. 1. The Allies felt it necessary to continue to justify the great sacrifices that were made in fighting two world wars. 2. The Allies wanted to divert attention from, and to justify, their own particularly brutal crimes against humanity. 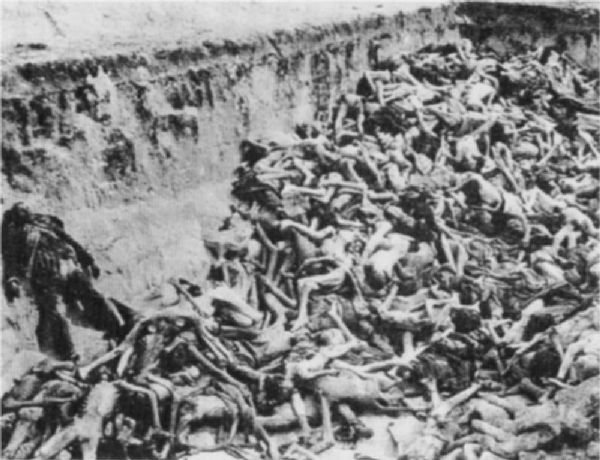 Soviet atrocities alone caused the death of uncounted millions of civilians in the Soviet Union and in all countries of eastern and central Europe. American and British saturation bombings of German and Japanese cities causing over a million civilians to be burned or buried alive. 3. The Allies needed justification for postwar arrangements involving the total dismantling of German industry, a policy of starvation causing the deaths of many millions of German civilians, the robbing of German patents worth trillions of dollars, and the annexation of large parts of Germany into Poland and the USSR. These territories were not disputed borderlands but consisted of 20% of the entire German territory. The twelve million Germans living in these regions were robbed of their property and brutally expelled. More than two millions perished during this most heinous ethnic cleansing of world history. For those who believe that the Nuremberg Trials revealed the truth about German war crimes, it is a terrible shock to discover that the then Chief Justice of the U.S. Supreme Court, Harlan Fiske Stone, described the Nuremberg court as “a high-grade lynching party” for Germans (Alpheus T. Mason, Harlan Fiske Stone: Pillar of the Law, New York: Viking, 1956, p. 716). Mass grave in the Bergen-Belsen concentration camp, dug and filled with deceased inmates after the liberation by British troops. We’ve all seen “The Photographs.” Endlessly. Newsreel photos taken by U.S. and British photographers at the liberation of the German camps, and especially the awful scenes at Dachau, Buchenwald, and Bergen-Belsen (see the image to the right). For instance, look at the one at the top of this leaflet. These photos and films are usually presented in a way in which it is either stated or implied that the scenes resulted from deliberate German policies. The photographs are real, but their interpretation is false. Even mainstream historians admit that there was no German policy at any of those camps to kill the internees. In the last months of the war, while Soviet armies were invading Germany from the east, British and U.S. bombers were destroying every major city in Germany with saturation bombing. Transportation, the food distribution system, medical, and sanitation services all broke down. That was the purpose of these air raids, which was the most barbaric form of warfare in Europe since the Mongol invasion. Still, at camps such as Buchenwald, Dachau, and Bergen-Belsen tens of thousands of relatively healthy internees were liberated. They were there in the camps when “The Photographs” were taken. There are newsreels of these internees walking through the camp streets laughing and talking. Others picture exuberant internees throwing their caps in the air and cheering their liberators. It is only natural to ask why you haven’t seen those particular films and photos while you’ve seen the others hundreds of times. It is often claimed that there are “tons” of captured German documents proving the Jewish genocide. When challenged on this, however, only a handful of documents are produced, the authenticity or interpretation of which is highly questionable. If pressed for reliable documentation, it is then claim that the Germans destroyed all the relevant documents to hide their evil deeds, or the absurd claim is made that the Germans used code language, whispered verbal orders, or conveyed orders through a meeting of minds. As a matter of fact, all available documentation and material traces indicate that there was no order for a mass murder of Jews, no plan, no budget, no weapon—that is, no gas chamber—and no victim—that is, not a single autopsied body has been shown to have been gassed. During medieval witch trials, many witnesses told similar accounts about broom-riding witches and the devil. Since most statements were made independently of each other and without pressure, this was taken as evidence that the stories must be true; material evidence was never produced. “Common knowledge,” a word invented in those days, and social expectations formed the basis of these accounts, not the truth. Today, we face the same “common knowledge” produced by 60 years of one-sided mass media propaganda and massive social and sometimes even legal pressure to conform to certain views. To support their theories, anti-Revisionists depend almost exclusively on “eyewitness” testimony produced in this poisoned atmosphere. During the war crimes trials many “eyewitnesses” testified that Germans made soap out of human fat and lamp shades from human skin. Allied prosecutors even produced evidence to support these charges. For decades, highly respected scholars at the most prestigious universities in the world sanctioned these stories, leading us to believe that such stories were “irrefutable truths.” But within time, many such stories have become untenable: In 1990, Yehuda Bauer, director of Holocaust studies at Hebrew University, Tel Aviv, admitted: “The Nazis never made soap from Jews…” (Jerusalem Post, Int. Ed., 5 May 1990, p. 6). Bruno Baum, a former communist inmate in Auschwitz, was allowed to brag in summer 1945 in a Soviet newspaper: “The whole propaganda which started about Auschwitz abroad was initiated by us [German communist inmates] with the help of our Polish comrades.” (Deutsche Volkszeitung, Soviet paper in occupied East Germany, 31 July 1945). Thus, it is not surprising to learn that during several trials in Germany, it emerged that the testimony of witnesses from eastern Europe had been orchestrated by communist authorities. During a trial against an alleged former camp guard in Jerusalem, even the Israeli court had to admit that all witness testimony was not credible, which resulted in the defendant’s acquittal. The only two witnesses who were ever cross-examined had to admit in 1985 that their accounts were not true: Arnold Friedman confessed of never having experienced what he had claimed, and Rudolf Vrba admitted of having used poetic license to “embellish” his statements. Vrba is one of the most famous Auschwitz witnesses. However, once asked if all claims Vrba had made about Auschwitz in the famous movie Shoa were true, Vrba replied: “I do not know. I was just an actor and I recited my text.” He told this with a sardonic smile to his Jewish friend Georg Klein (G. Klein, Pietà, Stockholm, p. 141). During and after the war there were “eyewitnesses” to mass gassings at Buchenwald, Bergen-Belsen, Dachau, and other camps in Germany proper. Today, virtually all recognized scholars dismiss this testimony as false. Establishment historians, however, still claim that mass gassings happened at several camps in Poland. The evidence for this claim is, in reality, qualitatively no different to the false testimony and evidence for the alleged mass gassings at the camps in Germany proper. With regard to confessions by Germans at war crimes trials, it is now well documented that many were obtained through coercion, intimidation, and even physical torture, just like during the medieval witch trials. The Auschwitz Museum has put on display piles of hair, boots, and eyeglasses, etc., but there is neither evidence for the origin of these items nor for the fate of their former owners. While such displays are effective propaganda, they are worthless as historical artifacts. Whereas some mainstream scholars claim that the Auschwitz crematories, whose morgues supposedly served as gas chambers, were the “absolute center” in the “geography of atrocities,” other mainstream scholars claim that the mass murder did not take place in those crematories, but elsewhere. Revisionist, however, want certainty, not speculations and estimates. Only two monographs were written so far on the question of how many Jews lost their lives during World War II. The first is a revisionist book concluding that some 300,000 perished. The second is authored by several recognized historians claiming that some six million died. Whereas the Revisionist book takes into consideration demographic changes of the Jewish population in all countries, the mainstream book compiles its figures by simply subtracting the number of Jews alive in Europe a few years after the war from those alive in Europe several years before the war. It ignores that the Jewish population in America, Israel, and other countries outside of Europe had increased by almost six million in this period of time, as a result of a new Exodus. Thus, those who had left Europe were simply declared to be Holocaust victims. Those who promote the Holocaust story complain that “the whole world” was indifferent to the genocide which allegedly was occurring in German occupied Europe. They claim that this was due to some great moral flaw in the nature of Western man, or that people did not realize the enormity of what was happening. It is true that the world responded with indifference. But perhaps it was because they did not believe it. It is certain that if there had been “killing factories” in Poland murdering millions of civilians, then the Red Cross, the Pope, humanitarian agencies, the Allied governments, neutral governments, and prominent figures such as Roosevelt, Truman, Churchill, Eisenhower, and many others would have known about it and would have often and unambiguously mentioned it, and condemned it. They did not! The promoters admit that only a tiny group of individuals believed the story at that time—many of whom were connected either with Jewish or with Communist propaganda agencies. The rise of the Holocaust story reads more like the success story of a PR campaign than anything else. Winston Churchill wrote his six volume work The Second World War without mentioning a program of mass-murder and genocide. In his book Crusade in Europe, Dwight D. Eisenhower also failed to mention gas chambers. Was the weapon used to murder millions of Jews unworthy of a passing reference? Was our future president being insensitive to Jews? During and after the First World War, that is between 1916 and the late 1920s, mainly American Jewish organizations were claiming that six million Jews(!) would suffer terribly in poverty stricken Eastern Europe. In this context, it was claimed that eastern European Jewry would face a Holocaust if they did not receive massive funding. With such propaganda, millions of dollars were raised in the United States, which at the end were mainly used to finance the Soviet revolution in Russia. On 22 March 1916, that is during the First World War, the British newspaper The Daily Telegraph published an article falsely claiming that the Germans had murdered 700,000 Serbs in gas chambers. On 25 May 1942, that is during the Second World War, the same newspaper reported that the Germans had murdered 700,000 Jews in Poland in gas chambers. How can we tell that the second story is true, if we know that the first is a lie? In 1944, the British Government asked the British media and churches to help spread anti-German propaganda, which it had been putting out already for a while, in order to distract from the atrocities it expected to be committed by the Soviets as soon as they invade Germany. In its circular, the British government expressed its regret that, after the exposure of WWI propaganda lies, greater efforts would be necessary to succeed this time. Many people are bewildered when they first hear Holocaust Revisionist arguments. The arguments appear to make sense, but “How is it possible?” The whole world believes the Holocaust story. It’s just not plausible that so great a conspiracy to suppress the truth could have functioned more than half a century. In our own society, in the debate over the question of political correctness, there are those who deliberately attempt to trivialize the issues. They claim that there is no real problem with freedom of speech in our society, and that all that is involved with PC are a few rules which would defend minorities from those who would hurt their feelings. There is, of course, a deeper and more serious aspect to the problem. In American society today there is a wide range of ideas and viewpoints which the mass media will not allow to be discussed openly. Even obvious facts and realities, when they are politically unacceptable, are denied and suppressed. One can learn much about the psychology and methods of the Thought Police by watching how they react when just one of their taboos is broken and Holocaust Revisionism is given a public forum. First they express outrage that such “offensive” and “dangerous” ideas were allowed to be expressed publicly. They avoid answering or debating these ideas, claiming that to do so would give the Revisionists a forum and legitimacy. Then they make vicious personal attacks against the Revisionist heretics, calling them political names such as “hater,” “denier,” “anti-Semite,” “racist,” “terrorist,” or “neo-Nazi,” even suggesting that they are potential mass murderers. They publicly accuse the Revisionists of lying, but they don’t allow the dissenters to hear the specific charge against them or to face their accusers so that they can answer this slander. Revisionists are frequently accused of being hate filled people who are promoting a doctrine of hatred. But Revisionism is a scholarly process, not a doctrine or an ideology. If the Holocaust promoters really want to expose hatred, they should take a second look at their own doctrines, and a long look at themselves in the mirror. Anyone who invites a Revisionist to speak publicly is himself attacked for being insensitive. When Revisionists do speak publicly, they are regularly shouted down and threatened. Libraries and bookstores face intimidation when they consider handling Holocaust revisionist materials. All this goes on while the majority of library, media, college, and university administrators sit silently by, allowing political activists to determine what can be said in the media and read in libraries. Next, the Thought Police set out to destroy the transgressor professionally and financially by “getting” him at his job or concocting a lawsuit against him. It is sometimes often deceptively claimed that Revisionist scholarship has been proven false during a trial, though courts of law can never decide any scholarly debates; they can only impose dogmas. Finally, the Thought Police will inevitably “straighten out” that segment of academia or media that allowed the Revisionists a forum in the first place. Some administrators in academia hold that university administrations should take action to rid the campus of ideas which are disruptive to universities. This is an open invitation to tyranny. It means that any militant group with “troops at the ready” can rid the campus of ideas it opposes and then impose its own orthodoxy. Coward administrators might find it much easier and safer to rid the campus of controversial ideas than to face down a group of screaming militants. But it is the duty of university administrators to insure that our universities remain a free marketplace of ideas. When ideas cause disruptions, it is the disrupters who must be subdued, not the ideas. The influence of Holocaust Revisionism is growing steadily both here and abroad. In the United States, Revisionism was launched in earnest in 1977 with the publication of the book The Hoax of the Twentieth Century by Arthur R. Butz. Professor Butz teaches electrical engineering and computer sciences at Northwestern University in Evanston, Illinois. Those who take up the Revisionist cause represent a wide spectrum of political and philosophical positions. They are certainly not the scoundrels, liars, and demons the anti-Revisionists try to make them out to be. The fact is, there are no demons in the real world. People are at their worst when they begin to see their opponents as an embodiment of evil, and then begin to demonize them. Such people are quite prepared to harm their opponents. The logic of their argument is that you can do anything you want to a demon. We should not allow such a logic to prevail. If you wish to learn more about Holocaust revisionism, we recommend our free brochure with answers to the most frequently asked questions and links to articles and entire books available on this topic. Those wishing to verify the truthfulness of the statements made above, can visit our vast Internet database at www.codoh.com and download many scholarly articles and books about this topic, including many references to primary sources, forensic research, and much more. Download this leaflet for free in legal size for free printing, copying, distribution.